Hello. I woke up this morning to a view of fog over the lake. At home, I meditate every morning, but somehow here in the middle of the woods, surrounded by silence (there’s not even the sound of many birds this time of year) I have no desire to meditate. I don’t have to. The environment is embodied by a stillness that infuses me with calm that I sink into. So instead of meditating, today I put on my coat and walked out into the brisk cold. I walked down to the dock and took yet another photo of the lake in the fog. The view never ceases to surprise and refresh me. Without effort, my feeling of awe from the stillness and beauty springboards me into the present moment. In my awe, I compulsively take the picture and usually never look at it again. Then I sit down on the dock bench and spontaneously take a deep breath of fresh air. It’s not a breath like the intentional deep breathing that I use to begin meditating, it’s a natural, present, spontaneous deep breath that’s sparked by my desire to smell the air and eat it like it’s fresh fruit– it’s so yummy (this is not Los Angeles air). While I sat there today, I thought about the habit of taking the picture. Taking pictures can be a way to consume the world instead of just being with it and being in the present moment. I rarely share these pictures publicly, so in a moment of mental productivity, I decided to share it and use this time to invite you (our readers) to begin to create your space, your stillness, your moment. 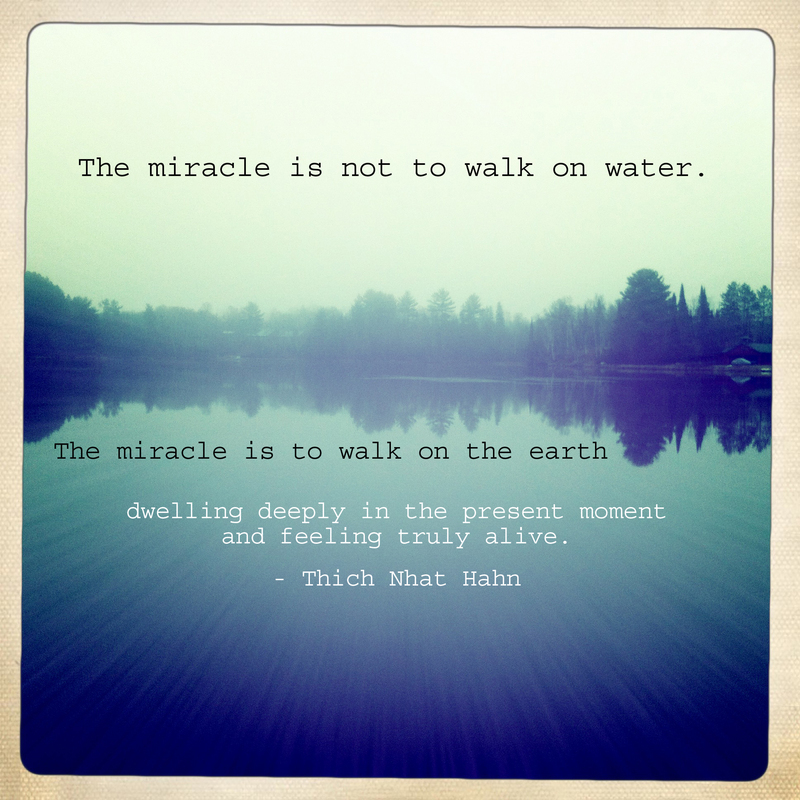 The picture (above) in this post is the one I took this morning, and I added a quote by Thich Nhat Hanh, who is a Buddhist monk and advocate for using mindfulness to bring peace into the world. First off, know that your mind is untrained and be patient. All of our minds are untrained. Just as most of us are not adept at training our bodies, we are not adept at training our mind. Sit comfortably. Eyes open or eyes closed– whatever feels safer. Do not believe that you need a quiet place. This is the myth of meditation #1. You can be free anywhere. Feel free to stand, even, but centering your thinking at your mind is key. In future posts, I will discuss how to recognize that your irritation with noise and meditative distractions is just a version of your mind that you are fighting with. 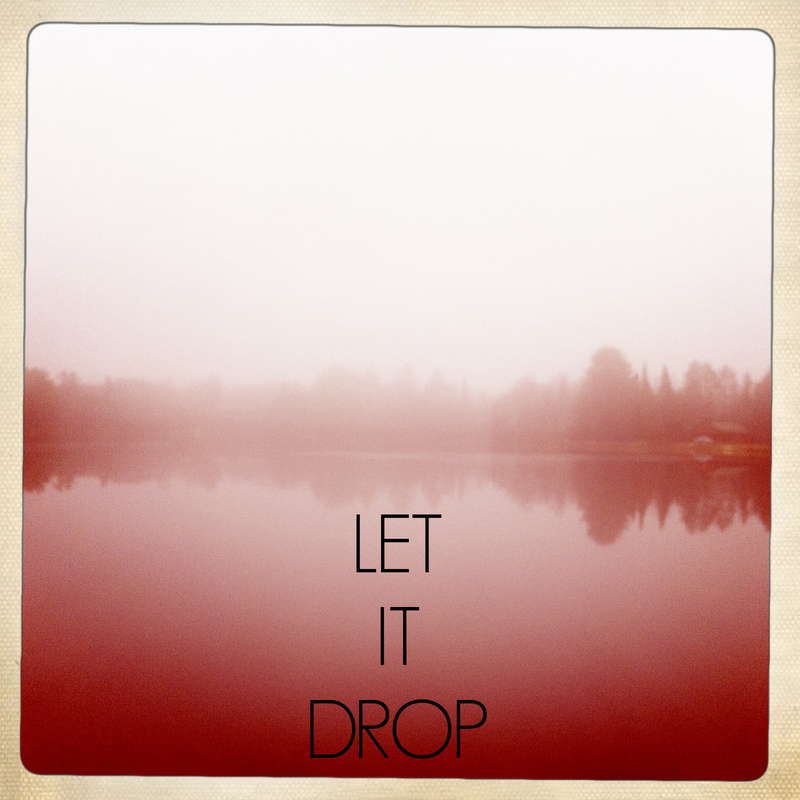 There is a saying in meditation: Let it drop. Trust yourself. You are naturally capable of this– it is your true nature: let it drop. Say this to yourself now and again as you sit there. Take a few slow deep breaths. Bring your mind to your breathing and notice it, but don’t worry about your other thoughts. Your thoughts are fine. You do not need to clear your mind of thinking. This is myth of meditation #2. Certainly, many, many meditation instructors and meditation descriptions require you to “clear your mind.” Or free your attachment from your thinking. Fooeey! Sometimes, I think that’s an unconscious way for teachers to maintain some mysterious power. There is another meditation saying to help out here: Just as your heart beats and your lungs breathe– your mind moves. The organ of the brain (your mind) must think. That is its activity. It cannot be without its activity or its function ceases. We wouldn’t want to stop our heart from beating or our lungs from breathing, right? Let your mind move. However, observe it. Just as your child doesn’t get to run through the streets wild without you watching, neither should your mind. You have the human ability for meta-awareness. Start to watch your thinking as you simultaneously watch your breathing. Where do your thoughts come from? Are you simultaneously able to notice your breath and observe your thinking? If you are, then add in your awareness of the environment, sounds in the room, sensations in your body. Can you sustain an awareness of all three? Most folks have difficulty with just noticing their breathing and not planning their breakfast. They get fidgety and expect some epiphany to happen. Really… you’re just sitting there. I hate to break the bad news. This is it– meditation is just sitting there. This is frustrating myth #3: You’re not going to levitate to the planet of la-la and bliss. You’re going to sit there and discover how trapped by your own mind, you truly are. It’s not fun (mostly). Ugh. But it does get better– it gets wonderful, even. But like weight training, it only gets better with practice. Then you will begin to feel free. Knowing that you’re just sitting there trapped in your own mind, be aware that this last step is VERY DIFFICULT. Try this for a few seconds at a time and alternate it with the previous step of watching your mind and breathing using meta-awareness. Think about an infant for a moment– just a few weeks old. Their brains are not organized with complex language yet and they experience the world through a very primal, present-centered way of being. They are learning to filter all of their sensations, yet they have no language to organize and label it. Now with this in mind, pick an object, or setting to look at. This is an eyes open meditation. Look at that object and try to see it without language, as a young infant would– no language just looking. Try to extract all of your preconceived ideas from your observation. Do this until your mind starts labeling it with language (which happens pretty quickly). Once language returns, go back to awareness of your breathing and start over. Do these three steps for a few minutes per day. You don’t need to start with more than a few minutes at a time until your body becomes more familiar with sitting still and and your mind more familiar with being controlled. I wrote this pretty quickly, so if you have any questions, please post below and I’ll be happy to answer them. In future posts, we will provide some guided meditation and have some video. Brian and I have been producing Nature Now, a DVD meditation series that provides a guided meditation through gorgeous natural environments (like the one you see in these pics). In the meantime, we hope that you get some moments to feel deeply present and alive wherever you are. Tags: Meditation, meditation how to, mindfulness, myths of meditation, nature now, Stress Reduction. Bookmark the permalink. Thank you for this. I really enjoyed your writing. I have been practicing for many decades and you have hit the nail on the head. I absolutely agree with all three of your meditation myths. There is so much honesty and truth in this article, it says a lot about you. I also agree with “fooey”. It is impossible to just clear your mind. For many people, that’s the whole point of their meditation in the first place. In addition, your description of how the mind works is spot on. There is an ocean of peace and love hidden within every breath – we have only to learn how to experience it. To experience and appreciate the “life force” within our breath is the greatest source of personal peace, because living within the conscious feeling of this power will tame our wandering mind and allow us to be who we really are – our true self – in peace and love. The gift of breath is everything – the beginning and end of human life. This is not something to be taken for granted, but is a reason, with every breath of our life, to feel appreciation and infinite gratitude. Those who are motivated from the longing and thirst within, will find the way – it is their destiny. What we practice, we become.This is a life long journey and we have this whole life to practice. The results DO come but perseverance is the key. And lastly – All dreams come true – in their own time. John, thank you for your amazing, thoughtful and thought provoking reply. It really added depth to this (not so mindful) quick post. Your description of the gift of breathing really embodies how important breathing is in anchoring ones meditation practice, and in anchoring one’s existence for that matter! Thank you! Stay in touch here and we are now enjoying your blog, too!